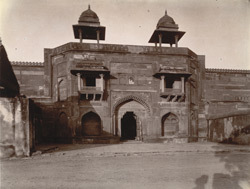 Photograph of the entrance to the Jodh Bai Palace at Fatehpur Sikri, taken by Edmund William Smith in 1893, from the Archaeological Survey of India Collections. Fatehpur Sikri was the Mughal Emperor Akbar's palace-city complex, built between 1571 and 1585. The Jodh Bai palace was part of the Haram Sara (Imperial Harem), which comprised a large number of buildings and apartments for the ladies of the court. The palace was the largest of these buildings with a central courtyard and a symmetrical four-iwan plan. This is a view of the entrance with its projecting balcony windows and two chattris on the roof.